The Cochin University of Science and Technology (CUSAT) is likely to publish the results of the B Tech 8th semester today, for the exam which was held in April 2014. With 21 affiliated engineering colleges under the University, the results of the final year would be much crucial for the students. 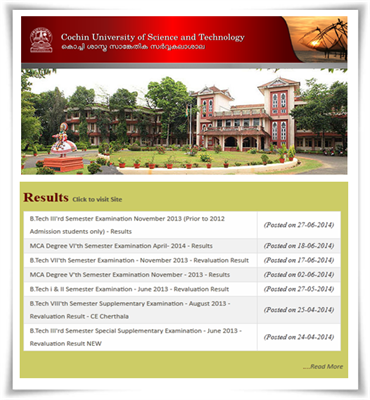 Those who had appeared for the final year B Tech exam can check their results through the official website of CUSAT. The following are the various B Tech Enginnering courses offered by Cochin University of Science and Technology (CUSAT). The colleges which are affiliated to the Cochin University of Science and Technology (CUSAT) are Toc H Institute of Science and Technology Arakunnam; College of Engineering, Chengannur; Model Engineering College, Thrikkakara; College of Engineering, Adoor, College of Engineering, Poonjar College of Engineering, Karunagappally; College of Engineering, Cherthala; and College of Engineering, Kottarakara; Cochin University College of Engineering, Kuttanad; MG College of Engineering, Thiruvananthapuram; School of Engineering, Thrikkakara; College of Engineering, Perumon; College of Engineering, Thalassery; Co-operative Institute of Technology, Vadakara; TKM Institute of Technology, Kollam; College of Engineering, Attingal; Sarabhai Institute of Science and Technology at Thiruvananthapuram; College of Engineering, Kallooppara; College of Engineering, Kidangoor; College of Engineering, Thrikaripur and College of Engineering, Munnar. In the previous year, 8 out of the 21 affiliated engineering colleges of the Cochin University of Science and Technology (CUSAT) managed to secure pass percentage above 60 in the final year B.Tech examination. The final semester results of 2014 can be checked as it gets published in the official website.